Many, many thanks to everyone who helped me sort out some thoughts on this lesson in our previous confab post, including but not limited to Fawn Nguyen, Robert Kaplinsky, Bowen Kerins, Dan Anderson, and Max Ray, and the many participants I pestered at OAME2014 this last week. Here’s the download link at 101questions. You guys were right. In the end it makes more sense to pose the student as the seller. It’s more productive and more interesting even though its easier to empathize with the buyer initially. 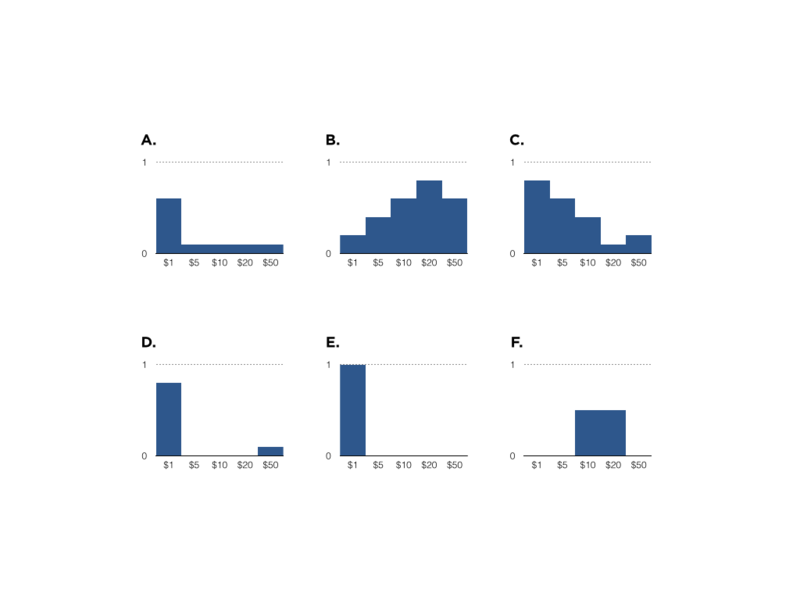 Now we’re going to introduce the probability distribution model. Show the students four distributions and ask them to make up a price for the distributions that would be fair to both buyer and seller, that wouldn’t result in money lost or gained. After laying all this informal groundwork, we’re ready to transition from qualitative descriptions to numerical and define expected value. 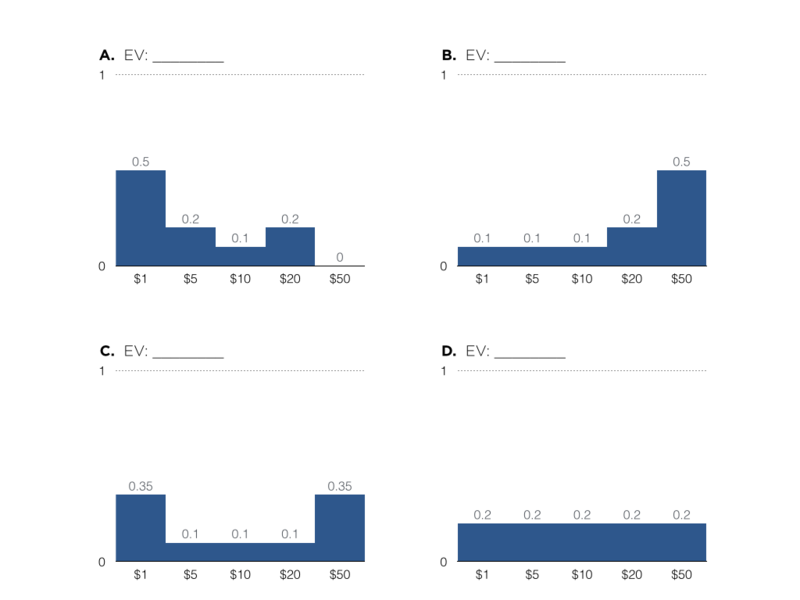 We ask them to calculate the expected value of the distributions from #4 and compare those values to their prices. If their intuitions were sound and their calculations correct, their intuition will support the validity of the expected value model. There’s no act three here. We don’t know the probability distribution of the Money Duck (I asked) so we can’t validate. That’s okay. 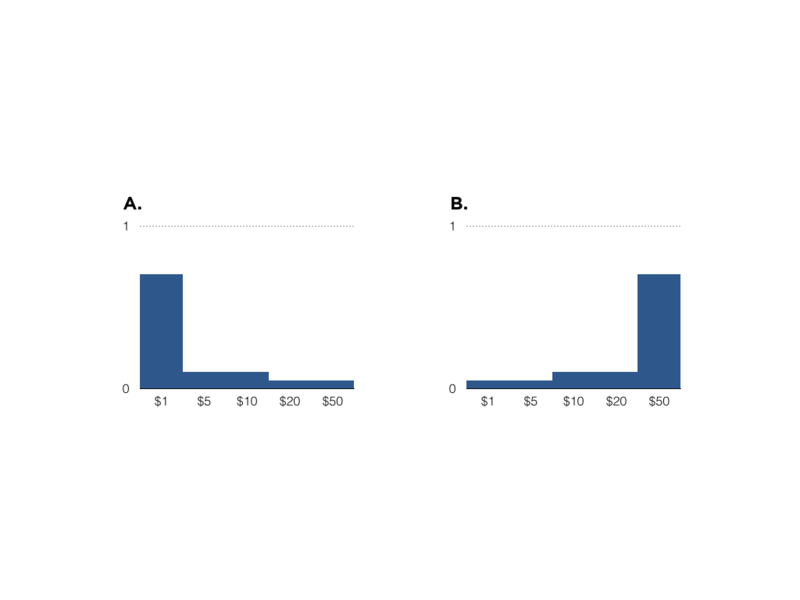 Let’s show the students the actual price of the Money Duck and ask them to determine a probability distribution that would give them a $3 profit per Money Duck as a seller. Answers, happily, can vary. A carnival game is played as follows: You pay $2 to draw a card from an ordinary deck of 52 playing cards. If you draw an ace, you win $5. You win $3 if you draw a face card (Jack, Queen, King) and $10 if you draw the seven of spades. If you pick anything else, you lose your $2. 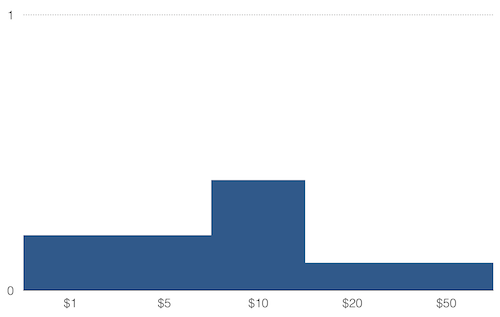 On average, how much money can the operater expect to make per customer? 2014 May 12. You should definitely read Dan Anderson’s experience running this lesson with students. This is a great result of the collective effort you led. You should send a link to this page to the company you asked for the information and see if they’ll give you a response or comment about how this process compared to their own. One other bummer-world version is the Wheel of Fortune slot machine found in Vegas. On inspection, the giant wheel at the top of the game has some great value: there’s a $1000 space, a $500 space, some others. And you can do some calculations, figure out how often the bonus is activated, and learn that based on what you see, you should come out ahead if you keep playing the game. While reading, I thought about how I might go about trying to resolve some of the questions posed in relation to this problem. I was reminded of a surprising technique to count/estimate unknown amounts — in the case of the youtube link the context is estimating the number of taxi cabs in London. Enjoy.